Greetings! Happy beautiful Tuesday. I’ve been working in the yard the last few weeks trying to tame the weeds and clean up the beds. This also includes helping train the climbers in my garden. Want to know which are my favorite trellises and climbers? It’s no secret I love flowers. I especially love flowers that come back year after year! My favorite perennial climber is the Clematis. I have several different colors and varieties. And somehow they seem to thrive in the Northeastern climate. One clematis is growing up the windmill in our back yard. 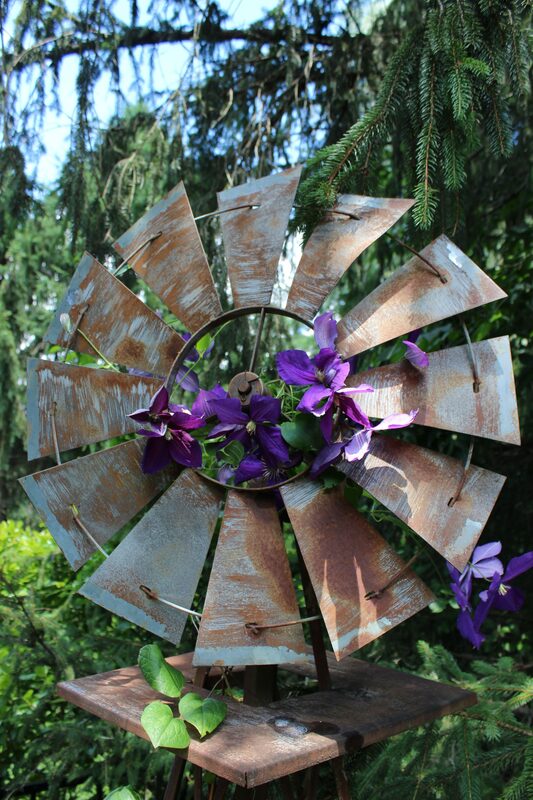 This windmill is purely decorative but actually spins. We bought it from a nursery when we lived in Colorado and brought it to Pennsylvania with us. For some reason there is a lot of wind here and the windmill takes quite a beating. We nestled it in between some trees to try and shelter it but 40 mile per hour winds can take a toll. It makes quite a racket when it turns but it looks pretty with the flowers climbing up the base and into the blades. A favorite trellis of mine is actually a piece of fencing. One of my sweet friends bought it for me when we let them stay with us for a week while they were house hunting. (I had my eye on it and she knew.) It was white and I painted it black. I love adding architectural pieces in our landscaping. It’s made of wrought iron and is very heavy. My husband anchored it into the brick mortar for stability and safety. This piece is placed against the back of the garage wall and in front of the dining room bay window. This beauty is coming with me when we move! (Sorry future homeowner.) #findyourown. And since fleur-de-lis are one of my favorite things….. I love how the vines curl around the obelisk form with little coaching. This is a store bought actual trellis covered by a white clematis. It hasn’t bloomed yet and I think there is a bird nest inside. This one is anchored to the back of the chimney stack. It will be stunning once it blooms. This trellis on the front of the house is a piece of delightfully rusted wrought iron. I’m not really sure what it was originally. For years I had it hanging inside the house but then thought it would be pretty outside too. And it is! Isn’t it fun to add fun things to your garden and yard to make it uniquely your own? I love to think that the flowers and trees we have planted over the years will bring joy to the future owners of this house. That, or they will wonder what kind of nut grew plants that climbed over everything? Hopefully the former.